Whether you are saving for a rainy day, a mortgage deposit, a dream holiday or that luxury sports car you always wanted... Saving is always difficult and these days, people elect to take a loan far too often. Saving for a special event or treat makes greater financial sense and means you make money on your money, not someone else. When you take out a loan, you pay thousands in interest, when you save, you earn thousands in interest and the longer you save, the more you get from your money. This savings calculator will help you to work out how long it will take to save the money you need. Using the savings counter is simple and we have added in a few touches to help you decide how much to save. Enter the amount you want to save. Enter how much you have already saved [optional]. Enter the Interest rate available for your savings plan. Enter your additional monthly saving [optional]. This will allow you to see how much quicker you could reach your target savings goal by saving an extra £5.00, £10.00, £20.00, £30.00, £40.00 per month etc. Saving can be very difficult, particularly these days when loans are so easily available. Effective saving and management of your finances takes strong will and sensible planning. Most people will say they don't have enough spare cash to save. The truth is that you can always find a way to save if you are determined to do so but you have to be a positive saver. The trick is to make saving simple and part of life, don't think of it as saving, it's feed the piggy money! 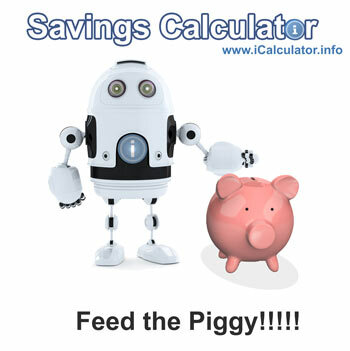 If you have children, tell them to feed the piggy and they will soon find loose change around the house. The point is to make saving a positive thing. 'Positive savers' are individuals who have made a conscious decision to save part of their money. It doesn't have to be thousands. Good saving starts with that first penny, we suggest opening a new savings account, putting a sealed tin next to your bed, sofa etc. and pop in your savings as you go along. Periodically empty the tins and pop them into your savings account. They will soon tot up. So, how do you save money when you don't have any spare cash? Here are a few tips to get you started, feel free to share your tips and saving experiences with us on Facebook. Smokers: Quitting smoking is difficult. New E-cigs make it easier to step away from cigarettes and can save you a fortune. My wife quite smoking using an e-cig (which she still uses), we went from spending £70.00 per week on cigarettes to less than £10.00 on e-cigs! saving nearly £240.00 per month! Drinkers: Have one less pint when you go out and pop the money in the tin. Not only will your head feel better in the morning but you will be amazed at how quickly that cash mounts up. Eaters: Well, we hope that's everyone. Swap one meal per week for beans on toast or poached eggs etc. Not only will this help you save but it will also help your waistline. Food portions: there are lots of articles out there that discuss how much food is wasted each year. Every ounce of food that goes in the bin is wasted money. Look at your food portions and see if you can reduce your food portion. This will mean your food stretches across meals and will help you keep trim. People often eat a full plate of food because they are served a full plate of food. That is silly, eat sensibly, save sensibly and feel healthier. Drivers: Walk to the shops!!! we all do it, laziness kicks in and we drive to the shops. Do that 6 or seven times a month and it clogs your engine with carbon, wastes fuel and increases the chance of maintenance costs. Pop your trainers on and walk, saving you money and helping your heart and weight. Heating: If you have a thermostat, turn is down half a degree. Even better, put a jumper/fleece on and add extra layers and keep the heating off. Water: If you haven't got a water meter, get one! most households are better off with a water mater, we saved £34.00 per month when we had a water meter fitted. Salary Sacrifice: Salary sacrifice helps you pay less tax and increase your take home pay, use the cash saving as your savings and save twice as much! More here of Salary Sacrifice.